Gabriel: What 2nd Year Bills Could Come On Strong? Former Bills Head Coach Marv Levy used to say that if he got anything out of a rookie player it was a bonus. It was in the second year of their career that Levy felt players should come on strong and become viable contributors for the team. In 2017 there were some rookie players who played well, with the rookie who played the best being first round selection corner Tre’Davious White. White had 69 total tackles as well and four interceptions as a starting rookie corner. As well as he played, White needs to develop more consistency in his play as well as make more plays on the ball. I feel it’s fair to say that he can be a future Pro Bowl type player and one of the better corners in the NFL as he gains experience. Second round pick wide receiver Zay Jones put up huge numbers in college as well as having a strong Senior Bowl week and Combine. Coming from a college spread offense where he didn’t play in a sophisticated passing attack and ran a minimal route tree, he needed development. He also had some off-field issues just after the season ended that was a concern for the front office. He also had minor knee surgery during OTA’s so he may be looked as a question mark in 2018. Still the Bills need him to come on in 2018 and there is no reason he shouldn’t. At 6’2 – 200 with 4.46 speed, it’s imperative that he improves his play. He had moments of superb play in ’17 but not as much as was hoped. He finished the season with only 27 receptions and two touchdowns. He needs to at least double that production and with this now being his second year as a NFL receiver, the growing pains should be gone. There is no reason he can’t do a better job getting off press coverage and finding open areas in zone. Jones has excellent talent and now it’s time to show it. When the Bills drafted Temple offensive lineman Dion Dawkins the thinking was that his NFL future would be as a guard. When Cordy Glenn couldn’t stay healthy, Dawkins was put at left tackle and started 11 games, playing to mixed reviews. Dawkins might not have the range and lateral agility that is wanted at left tackle but he has quick feet and understand angles. At 6’4″ he lacks ideal height but he has long arms and reality he is more athletic than Glenn was. I feel that because he knows it’s now his job he will play very well and prove that he can be a winning left tackle in the NFL. The player that I am excited to see in 2018 is last year’s fifth round pick linebacker Matt Milano. The Bills didn’t plan for Milano to be a starter in 2017 but had to start two games in October because of an injury to Ramon Humber. In this two starts, Milano played very well and ended up being moved into the fulltime starting position later in the season. He showed improvement with every game. Milano has very good speed and athleticism and also top instincts. He is consistently in the right place and makes plays. He is the ideal player for Sean McDermott’s defense which puts a premium on speed and instincts. Last year Milano recorded 50 total tackles and I would think that he will more than double that production in 2018. The other second year player who could come on a put himself in position to get play time is tackle Conor McDermott. McDermott was a Patriots draft choice a year ago but was waived at the final cut down. McDermott is athletic but needed to add bulk, strength and power to his frame which he has done. With the Bills having lost two starters from last year (Eric Wood, Richie Incognito) they need strong and improved play from plays such as McDermott. While McDermott might not be a starter in 2018, he could become a key reserve on the O-Line and be the first guy off the bench in case of injury. 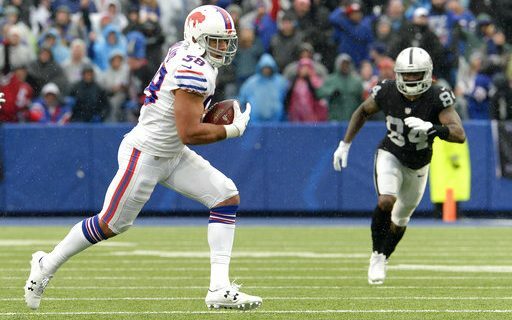 The Bills showing improvement in 2018 will have a lot do with how these young second year players play. If they improve the Bills will be the better for it. Second year QB Nate Peterman has a chance to be the Bills starter, according to Paul Peck.